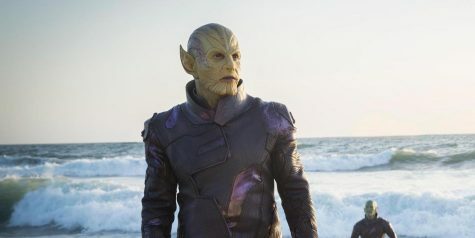 Ben Mendelsohn portrays the head leader of the Skrulls named Talos. His supporting performance was praised by both fans and critics. The Marvel Cinematic Universe continues to expand its franchise to more audiences and always finds ways to bring them back wanting more. From the now multiple Oscar-winning “Black Panther” to the massive crossover that was “Avengers: Infinity War,” fans have been eagerly waiting for what was to come next in this growing franchise. 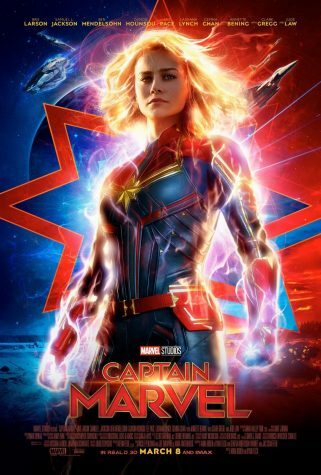 Now, the wait is finally over for fans, they were not only brought another entry but an entry that introduces a brand new character in the form of “Captain Marvel.” The film stars Brie Larson, Samuel L. Jackson, Ben Mendelsohn, Jude Law and Clark Gregg. So, how was the film? Does Marvel kick off the year on a good note? Let’s talk about it. Without spoiling anything, “Captain Marvel” centers its story around Carol Danvers (played by Brie Larson), who goes on a journey of self-discovery. With the help of a younger Nick Fury (played by Samuel L. Jackson), Carol will soon realize that there is more to her than meets the eye. Brie Larson leads the first female-led film in the Marvel Cinematic Universe. Larson has stated that this role is the height of her career. As an origin, the film does what it needs to do. It presents its character well enough and delivers a story with lots of fun and action. There’s one story element that worked very well and was one I personally didn’t see coming. The action is very entertaining and visually pleasing. From all the performers, Ben Mendelsohn steals the entire movie. His character is full of charm and life. He felt completely natural and had complete control of the character he was playing. The supporting cast was also good for the same reason I gave Mendelsohn. The deaging technology used for Jackson and Gregg worked to their advantage. Beyond that, the film has a lot of issues. The film finds its strengths in strong supporting performances and entertaining action. However, its script was what ultimately brought it down overall. The first of many come from the main lead herself. Brie Larson is ultimately fine but not great. Her character is very one-note and not as in depth as other heroes in this growing cinematic universe. Also, without spoiling, there’s no threats towards her and doesn’t provide many stakes as a result. With providing an origin to a superhero, the hero must have a certain point of vulnerability which makes them become less stiff and more human. With this, we don’t see that and the film failed to provide ultimately a critical point to a superhero origin. The biggest factor that the film suffers from is its script. The dialogue was very straight forward and not as clever as other installments in this franchise. Most of the humor never lands and doesn’t have any quotable lines for the viewer to take with them. Next, the narrative is very predictable and by the numbers for the most part. It tries really hard to go deeper but doesn’t really hit its mark. There were some story elements that I didn’t find myself getting behind at all. Some character choice reveals didn’t sit with me well or play out the way I was hoping they would. “Captain Marvel” is just fine. It does what it needed to do and doesn’t add anything else. It has its moments of fun but ultimately struggles from an average script that then sadly led to the creation of a one note character and a very predictable narrative as a result. However, this is a one-note character that I look forward to seeing more of and hope to see grow in this ongoing franchise in the near future. I think this movie is much better than what you’re saying. Personally, as a woman, it is incredible to see a powerful woman on screen. I can name you many quotes from this movie when she is sticking it to the various men who doubt her. Her vulnerability is her emotion which is stated in the very first scene of the film, the twist on that is that her emotionality, which is at first seen as weakness and vulnerability, turns out to be what makes her human and ultimately what makes her strong in the end. I don’t think you did this movie justice with your review. Hey Taylor,Chris is a movie critic, not a social justice critic. He is completely justified in saying this movie was bland and by the numbers. Generic plot, generic characters, obligatory funny cat, keep giving Disney your money as you feed off your belief that watching Captain Marvel will help actual girls in need across the world while Disney itself doesn’t give two flying pigs. Why do people keep paying for the same formulaic baloney like this movie and Black Panther? This movie adds nothing to the overarching plot and watches more like a single episode of a cartoon I just paid 17 bucks to see. Chris made a great review you have no business in trashing it just because he didn’t give it a glowing review for her being a woman. A movie should stand on the merits of its cinematography and story, not what gender or race its actors are. I agree with Darius, you can’t base reviews on its level of diversity like many try to do today in order to get certain political sides to praise them. I actually disliked the fact that they added scenes where men “doubted” her. I feel like that is just setting up a stereotype that men doubt women all the time. I think that the article’s author did do this film justice. Unlike many who base their reviews on diversity, this author focused on the plot and the dialogue of the film. Taylor, you are wrong. I watched this movie and payed $22 to watch it. I did not like it when they added in the scenes where Carol’s dad yelled at her for crashing her Go kart. Why did her dad yell at her? That scene was totally unnecessary and did not add to the plot at all, unless you wanted to see some old man yelling at a 6 year old who is bleeding from the head. All that scene wanted to do was empower females. I agree that this movie was much better than described in the article. I realize that some parts may not be as powerful to men as they are to women or to people who like strong female characters. And for David, personally, I have been doubted by men around me many times throughout my life so when Captain Marvel had moments of “sticking it to the man,” I loved it. I understand that having a main female character in a marvel movie might not be as relatable as you’re used to so it makes sense that you don’t favor it as much. However, this movie gave others the chance to relate to someone strong and powerful just like you can with the 20 other marvel movies led by men. Hey Maddy, Darius here. A superhero is not supposed to become a superhero to stick it to people, a hero is someone who is selfless and has defined morals and protects everyone. So if you want the role model for little girls to be someone who is constantly pursuing goals just to stick it to others and in general be a selfish person then, by all means, go ahead. Stan Lee wrote male characters with good morals and human flaws, he wrote female characters with value and integrity who by all means were role models for both young boys and girls. This Captain Marvel is a caricature, a big bobble head who spews buzzwords and screams feminist slogans that do nothing but prove that gender does not define someone’s goodness, it’s their actions. The movie was bland and Carol Danvers is a F tier character who is OP just for the sake of being OP. how did an argument about femenism start from a movie review that did not even mention that. Like what Darius said, Chris is a movie critic. Why cant the comment section just talk about the movie or recommendations for Chris. Do you take recommendations for older movies as well for review, or only for newer ones? The controversy and boycotting around this movie started before the film even came out. Brie Larson made questionable comments towards white men during a speech for the film, including that “movies should be reviewed by the intended audience”, which started the Rotten Tomatoes boycott (more on this later). If you’re confused why this is a bad thing, filmmakers should specify that only these specific people are meant to enjoy the film, instead of calling review websites to say “Wait wait wait, we don’t like those reviews. Remove them at once. Those are ‘white dudes’ and they aren’t even supposed to enjoy the film”. She made things even worse by commenting to a news crew that being a woman in Hollywood is “hard” for her. She’s rich, she’s attractive, and she’s famous. What’s hard about that? She may not be, but she comes across as very stuck-up and as a “radical feminist”, which is not a term I use often because I think it’s offensive, but for the sake of this argument, it applies. Unfortunately, media is biased. They happen to be biased towards minorities, and somehow women are minorities in the eyes of the media. I haven’t even begun with the movie yet. 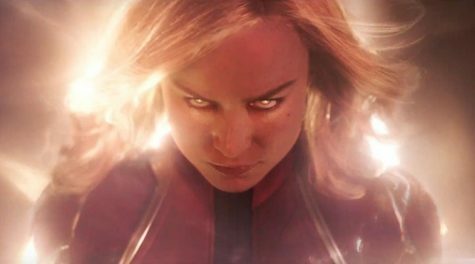 Captain Marvel, as a character, is inherently overpowered as a superhero, which isn’t a massive problem. The problem is, as mentioned by other people, that the plot and dialogue was twisted to turn it into a feminist movement rather than a superhero film. It wouldn’t have been such an issue if Brie didn’t constantly “stick it” to guys. I walked out of the theater before I finished the movie because of how disgusted I was with the dialogue, not to mention the director (who commented that men are like “dinosaurs who can’t accept seeing a woman in a lead role” and that we’re just “walking towards the tar pits”. That’s gross, seeing as films like Wonder Woman and The Hunger Games trilogy did so well. They did well because they didn’t alienate men, however they still managed to promote women, which is amazing and frankly wonderful). Rotten Tomatoes deleted thousands of Captain Marvel reviews off of their website, and they first blamed this on a “glitch”. When people started prying for information, they confessed to automatically deleting low reviews, calling the reviewers “trolls”. Apparently, being annoying to Mrs. Larson takes away our Constitutional free speech right. That is disgusting. Also, don’t try to spin it like Brie by saying the movie “wasn’t meant for you”, because Marvel Studios is a corporation that doesn’t have the budget or mindset for a niche film. They obviously gave the director free reign and he ran with it and burned a lot of Marvel’s bridges in terms of viewership and support. SUMMARY: The media is portraying this as an “attack on women” when it’s really just a bad movie with bad reviews. 2/10, would not recommend. Decent special effects, though.